Chile elections: Bachelet to the future? Chile will hold general elections on 17 November, with the presidential contest to determine successor to conservative Sebastián Piñera, in office since 2010 and constitutionally barred from seeking consecutive reelection. Former leader Michelle Bachelet (2006-2010) is favourite to win this year’s Chilean election, having left La Moneda (the home of the Chilean presidency) with sky-high approval ratings and after spending most of the last four years in a high-profile job as head of the UN Women agency. She is up against a fragmented centre-right opposition, whose current government (under Sebastián Piñera) has been dogged by dismal approval ratings and internal disarray in the run-up to the final campaign: whereas Bachelet has been pencilled in as the centre-left Nueva Mayoría (New Majority) candidate for most of the current electoral cycle, Alianza (Alliance) candidate Evelyn Matthei is arguably the third or fourth name to have been drawn from the hat, after previous contenders had to drop out due to allegations over shifty off-shore accounts and bouts of depression. Assuming Bachelet wins, her government will have plenty to answer for, as the high-profile student-led protests that have dominated national news coverage since 2011 have brought to the surface all the dysfunctionalities of the Chilean education, political and social spheres. Bachelet’s first administration was the last of four successive centre-left governments under the Concertación coalition, which stands accused of failing to sufficiently make up for the divisive social and economic legacy of the military dictatorship of Augusto Pinochet (1973-1990), among which can be included the fact that Chile remains one of the most unequal countries in the world, and that the current electoral system disproportionately favours the continuation of a two-party system with little space for new political actors. Much of the Alianza’s arguments against Bachelet and the New Majority throughout the current campaign focus essentially on this idea: if they are promising all this, why didn’t they do anything about it last time they were in power? Bachelet is running on a far more reformist ticket this time around, with promises to write a new constitution that will do away with the authoritarian enclaves still present some 40 years after the coup that brought Pinochet to power, as well as free education for all (the principal demand of the student protests) and tougher environmental laws, in particular with regard to hugely unpopular mining and energy projects, many of which were approved under her watch last time around. However, the election is not a closed matter yet, and with a record 9 candidates offering plenty of choice to Chilean voters, there is a pretty decent chance that Bachelet will be unable to muster more than the 50% of votes cast in the first round, meaning that her still-probable victory will have to wait until after a second-round vote in December. 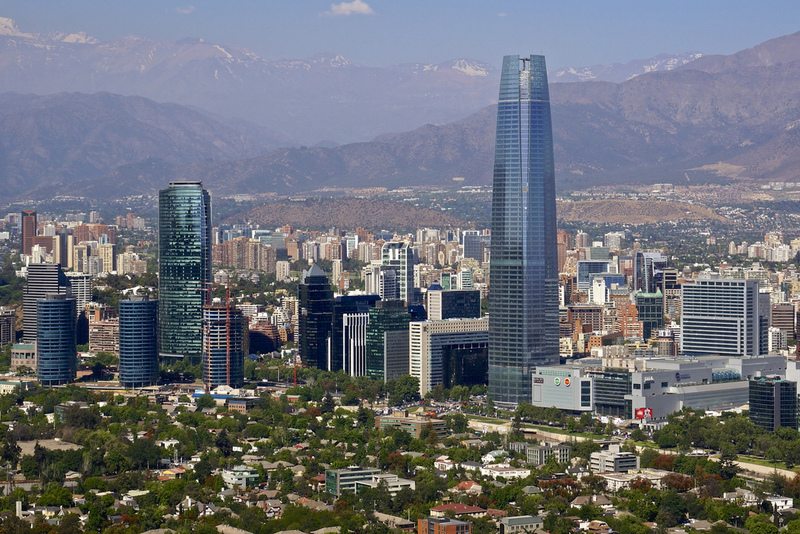 The capital of Chile, Santiago. Photo courtesy of alobos via Flickr. However, in social terms, it could be argued that this “development” has come at a price. It has become more apparent in recent years that the somewhat “pacted” nature of the re-democratisation process of the late 1980s and early 1990s, whereby the political and economic elites, General Pinochet among them, agreed to allow for a smooth transition back to democracy in exchange for maintaining the institutional framework that had allowed them to prosper so much during the 17-year regime. There was a degree of amnesty protecting the perpetrators of some of the regime’s worst crimes, preventing them from being brought to justice, and Pinochet himself died in 2006, almost 17 years after the return of democracy, under house arrest and having never been officially tried for any crimes against humanity. Additionally, the country’s constitution, written at the height of his regime in 1980, allowed for the imposition of a strictly neoliberal socio-economic model, as well as other authoritarian and conservative elements, along with rules that have made it exceptionally hard to enact any reforms during the democratic era. Despite some reforms made at times over the past 24 years, the same constitution remains in place, and it is in this context that Bachelet’s promise to compose a new text, possibly by convoking a Constitutional Assembly, has been arguably the most talked-about aspect of the current election campaign. The longevity of the constitution can also be used as a plausible explanation for the lack of progress made in social areas under 20 years of centre-left Concertación rule, although the latter was certainly not blameless. The central focus of the student-led protests that have so shaken the country since they sprang into action in May 2011 has been the stratification of the country’s education system. Chile’s schools are a mix of municipal-run schools, much in the mould of traditional state schools, joint public-private schools, which are essentially state schools but part-funded by top-up fees, and more classic private schools. While private schools remain the preserve of the elite, with attendance being roughly 7% of the population, the remaining schools are more or less evenly split among municipal and public-private lines. However, the fact that almost half of the pupil population is enrolled in top-up fee-paying schools, with the municipal schools having to make do with shoddy state funding, has arguably led to a system whereby a child’s life and career prospects are largely determined from an early age, depending on what type of school their parents are able to afford sending them to. To make matters worse, the country’s university system is among the most expensive in the world (according to the Organisation for Economic Cooperation and Development – OECD), meaning that the socio-economic standing of a pupil’s family has even more of a say on their education and career chances. It has therefore been argued that Chile’s historic social stratification – which gives it one of the highest levels of economic inequality in the world – is reinforced and possibly even made worse by the country’s education system. It is for this reason that students have been mobilising, marching, and occupying campuses, demanding an end to profit-making in private education establishments, and an end to fee-paying education across the board: not just at the school level, but in tertiary education as well. Only by achieving this, they argue, will efforts to increase social mobility in Chile bear any fruit. Bachelet has promised to try and bring about these changes, but once again, it is an area in which she has already tried to make some headway during her first term as President – indeed, the “original” student protests, dubbed the “Penguin Revolution”, occurred in 2006, at the start of her first term. Attempts to reform the education system, by removing the profit-making element and making it as level a playing field as possible, have been frustrated by the country’s constitution: a two-thirds majority in both the Chamber of Deputies and the Senate is required for any alteration to the constitution, but Chile’s electoral system has made this exceptionally difficult. The “binominal” system means that each electoral district returns two representatives, but in order for one party or block of parties (as is often the case) to win both seats, it has to win double the votes of its nearest challenger; otherwise, the first- and second-placed coalitions each return one candidate. This is the case even if one coalition sees its two candidates ranked first and second in the voting. For example (and I’ll try and make this as simple as possible! ), if the New Majority win 60% of the vote in one district, with their candidates taking 35% and 25% respectively, but the Alliance win 40% with both candidates taking 20% each, even though the New Majority candidates have come first and second, they have not secured enough votes to knock the Alliance entirely out of contention. Therefore, the highest-ranked New Majority candidate (first overall) and the highest Alliance candidate (ranked third overall) are elected. The system has meant that for much of the 24 years since the return to democracy, the two chambers in Chile’s Congress have remained fairly evenly balanced, even when in the initial years of the new democratic era, the centre-left enjoyed close to 60% support across the country, while the centre-right typically won only a third of the votes. A new constitution under Bachelet’s watch would attempt to correct this aspect. The more moderate of the centre-right parties, Renovación Nacional (National Renewal), which is also President Piñera’s party, has shown itself open to discussions with the parties of the left and centre-left over the sort of congressional alliance that might lead to the necessary changes being brought about. If such a deal can be struck following the election, changes in areas such as education, health, the political system and others may be possible, and we could start to see Chile’s enormous economic success of the past couple of decades begin to make itself felt among the wider population. (I should point out at this stage, in the interests of some sort of balance, that the Alliance candidate Evelyn Matthei is not so keen on the idea of rewriting the constitution, or granting the requests of the student protesters. However, if it seems like I’m not taking her candidacy as seriously as Bachelet’s, it should be noted that hardly anyone outside of her campaign team is really talking up her chances. All polls seem to point to Bachelet enjoying a comfortable lead over Matthei, even if it looks quite possible that the election will go to a second round, with sizeable protest votes going to alternative candidates Marco Enríquez-Ominami and Franco Parisi, among others. A recent poll suggested that, even leaving aside actual voting intentions, fully 75% of voters expected Bachelet to be the next president, against just 6% who said the same about Matthei). Michelle Bachelet prepares to hand over the Chilean presidency to Sebastián Piñera in March 2010. Will he be repaying the favour in March 2014?